China is a country with 5000 years of history, more people than anywhere else on the planet and an economy growing faster than anyone would have thought possible. It’s also, of course, the logical place for all serious students of Mandarin Chinese to end up, at least for a while. You can go as a tourist and practice your language skills as you travel the country. You can go as a part-time student at a private school or organization. You can take the plunge and register as a full-time student at an accredited Chinese university. Across a total of about two years in China, from Chengdu to Shanghai, I’ve experienced all three, and will attempt to distill some of my experiences and help you figure out which option is best for you. For: Anyone who’s feeling pretty confident about the level of Chinese they’ve managed to achieve so far, and who wants to see how they fare in the real world. Time: Two weeks to two months. Budget: Flights, visa, plus about $350 a week depending on how attached you are to creature comforts. The satisfaction you’ll get from ordering your first meal from a small noodle house on the streets of Beijing, directing the taxi driver back to your hotel and then going on to buy a train ticket to your next destination—all in Chinese—will be tremendous. Suddenly, all those hours in the classroom will feel worth it. Travel in China is endlessly fascinating and rewarding. It’s also exhausting. The country is absolutely enormous, most people you encounter won’t speak English and the culture shock you’ll confront can be challenging beyond belief. It’s absolutely possible to travel in China even if you don’t yet speak much Chinese. I’ve done so—it was tough, but I survived and had a great time. But, doing so isn’t likely to help you improve your Chinese skills as much as some other options, for the simple reason that it’s just too much immersion. You’ll be drowning in the language, and won’t have the structure on which to place all the new words and characters that’ll be bombarding you every minute of the day. 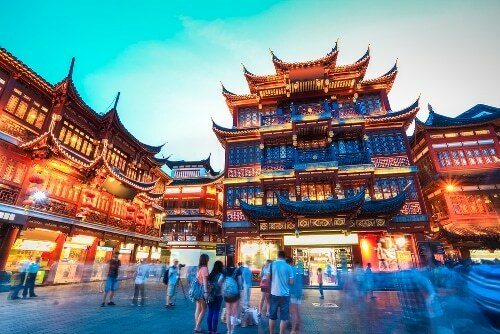 If you’ve been studying Chinese for at least a year already, then traveling in China is a fantastic way to sharpen your skills. If not, then you probably want a bit more structure to help you process and make sense of what you’ll be learning. This is where options 2 and 3 come in. Tips: China is infinitely vast and there’s no right or wrong way to travel in the country. Be aware that local dialects vary dramatically, and most people, particularly older citizens, speak their provincial dialect as a first language and Mandarin Chinese as a second language. Starting with Beijing is a safe bet, as that’s where standard Mandarin originated. For: Anyone who plans to combine language study with a work opportunity in China, or who’s interested in a social environment that provides travel and cultural activities in addition to just language study. Time: Flexible, but normally 6 weeks to one year. Budget: Varies widely depending on city and what’s included, but you’ll likely need at least $1000 per month. As China opens up to the outside world, more and more private schools are offering Mandarin lessons to expats and interns, mostly in major cities like Beijing and Shanghai. This can be a more relaxed option than studying at a Chinese university, giving you the chance to mingle with other international students of all ages and participate in cultural events and activities. Some schools are also tapped into the local job scene, and can provide internships with international companies who operate in the country. Accommodation will often be included, though be warned that standards in China are likely to be a bit lower than what you’re used to at home. My personal recommendation goes to Hutong School, which has branches in Beijing, Shanghai, Chengdu and Hangzhou. Also worth checking out are Mandarin House and Keats School. Tips: If you’re new to the language, I recommend at least 8 hours a week of study time to get you up to speed and increase your confidence. After a month or so you’ll already start finding your Chinese skills useful in the real world. The more you can speak Chinese out on the street with real people, the less time you’ll need in the classroom. For: People who are committed to mastering Chinese, getting a Chinese language certificate and going on to use Chinese as part of their work-life. Time: Minimum one semester (4 months) but I’d suggest a full year as this gives visa advantages plus a better chance at a scholarship. Budget: In my experience, most foreign students get some kind of scholarship, which makes this option much easier than you might think. Your chosen university will likely be able to help you with this. Otherwise, budget a couple of thousand USD per semester for study fees. Living expenses on campus can be extremely cheap, with $100 USD per week being more than enough to get you by. Most students who end up studying at Chinese universities do so as part of their coursework at home, on an exchange program or as an extension of their studies arranged by their university. They’ll normally have some background in Chinese—a minimum of HSK 3 is often required for major scholarships. Unusually, I found myself a full-time student at Chengdu’s Sichuan Normal University outside of any exchange program, without speaking even one sentence of Mandarin. Despite this, I went on to have an amazing semester and learn a ton—definitely one of the most fascinating travel experiences of my life so far! Not all universities are created equal. Mine was a small college in a second tier city, meaning there were few foreign students—only about eight fellow English speakers on campus—and some teachers, understandably, struggled with my complete lack of Chinese. The advantage was that I had a completely authentic Chinese experience, met amazing people from parts of the world I would never normally have been exposed to, and left with a nascent grasp of Mandarin essentials that I would hone over the next couple of years. If you’re after the full on “disappear into China” experience like I had, then go for it. To be honest, I hadn’t even heard of Chengdu (embarrassing, right? I mean come on, they have pandas!) before I made the decision to live there. If you’re a bit more sensible, a bit more committed to learning Chinese from experienced teachers and want a student experience that’s more consistent with what you’ll find at home, then there are a few major hubs to be aware of. Some universities worth checking out include: Sun-Yat Sen University in Guangzhou, Nanjing University and Tsinghua University in Beijing and Jiao Tong University in Shanghai. There are hundreds more, but based on what I’ve heard from the grapevine and what I’ve seen on my own visits, those listed above are great options to begin your search. Tips: Having an open mind isn’t optional. Things will be different, strange and confronting—and learning a language in such an intense environment can be frustrating. But, that’s the point! If you’re dead serious about mastering Mandarin, studying at a Chinese university is an essential experience that you’ll remember for years. No matter which option you choose, I’m certain you’ll have an amazing experience in China. Going there is the real thing, and I can’t wait to hear about your adventures! Nathan J. Thomas moved from New Zealand to Chengdu, China in 2014 without speaking a word of Mandarin. He is traveling as a freelance writer and editor of the online travel magazine, Intrepid Times.